The Riber 420 Inflatable Kayak is the perfect solution for when storage is an issue. It’s ideal for taking away with you camping, caravanning and even abroad thanks to the included storage bag. 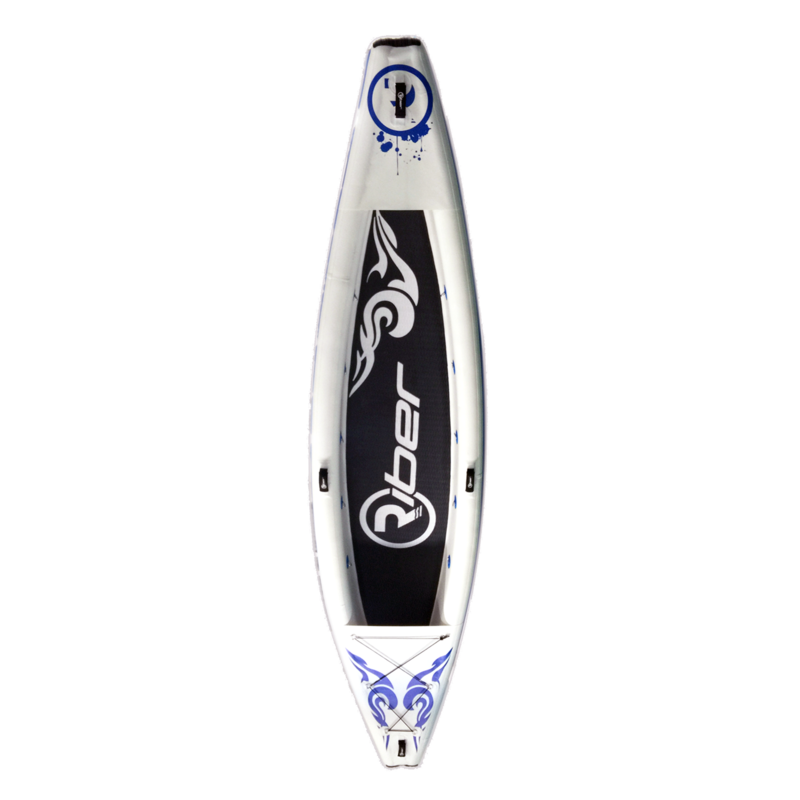 The Riber 420 Inflatable Kayak is the perfect solution for when storage is an issue. It’s ideal for taking away with you camping, caravanning and even abroad thanks to the included storage bag. 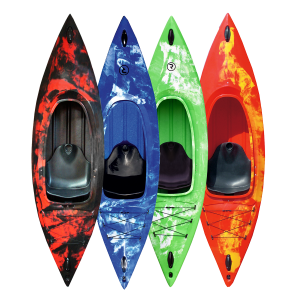 This kayak is unlike other inflatable kayaks on the market as it has a drop stitch construction. This is the same method we use for all of our highly rated SUP’s. The term drop stitch refers to the thousands of tiny fibres that go between the top and bottom layers of the reinforced PVC layers. This fortified inner body allows for a high pressure inflation of around 15 PSI. Encasing the 500 denier drop stitch is a top and bottom layer of 0.5mm 1000 denier polyester plain weave laminate. This makes the hull extra strong and adds stiffness. 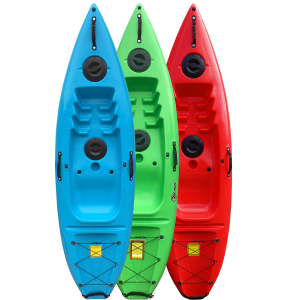 The Riber 420 Inflatable Kayak has two layers of glued high density PVC to increase the rigidity and strengthen the skin of the kayak. It also has a UV protected graphic print. The Riber 420 Inflatable Kayak has a heat embossed 3mm thick EVA deck to provide maximum traction and durability. Additionally the high pressure valve creates an airtight seal from dust and water. It boasts a lockable deflation setting making stowing away quick and easy. The Riber 420 Inflatable Kayak comes complete with two of our Standard Backrest #4017 which can be seen here. 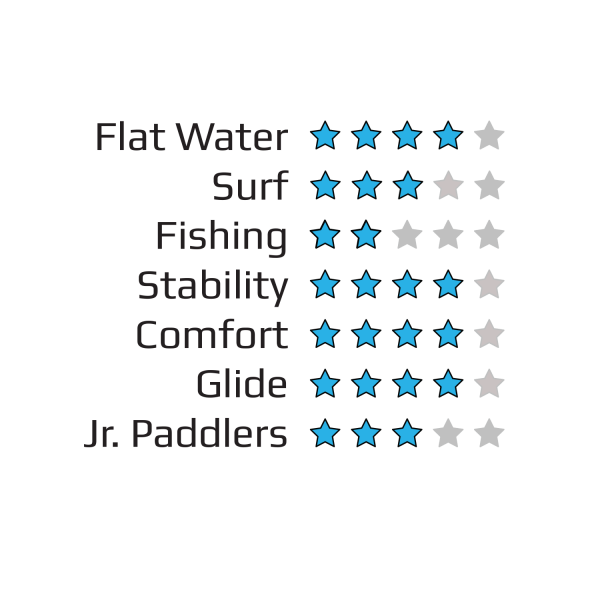 It’s a very comfortable kayak and benefits from fully adjustable footrest cushions. This kayak can just as easily be paddled solo by removing one of the backrest and footrests. You can move the remaining set to the middle for a better paddling position. 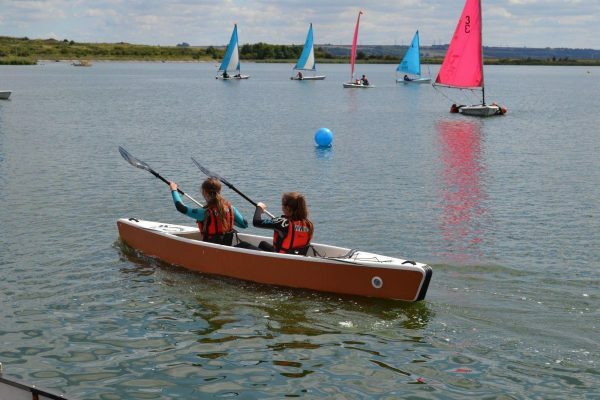 There is a reinforced PVC keel at the front and back of the kayak which aid tracking and helps to protect it from being dragged on beaches. 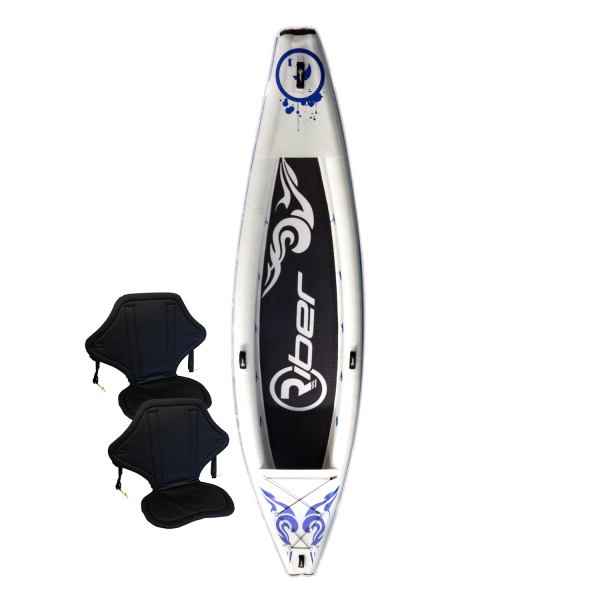 The Riber 420 Inflatable Kayak also has a removable large rear fin which assists with the tracking and stability of the kayak. This kayak also comes complete with double action pump to inflate. 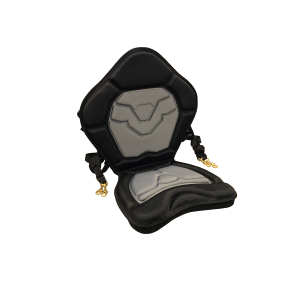 You may wish to consider the discount we offer for buying this item as a starter pack. 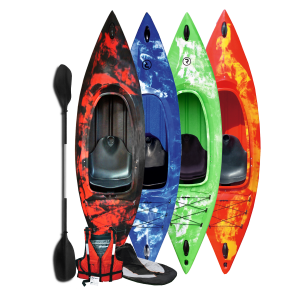 A starter pack includes the 420 Drop Stitch kayak, 2 x buoyancy aids and 2 x folding paddles, it can be seen here. The front and rear of the 420 Drop Stitch kayak have some coverage from the elements. The rear also has a small bungee storage area for securing items such as dry bags. The Riber 420 Inflatable Kayak is ideal for couples or family expeditions. It is incredibly stable and offers a great solution to beginners. It paddles well on lakes, rivers and the sea so can suit many different locations. The lightweight, packable construction means transporting this kayak is a dream.